Kitchen and Residential Design: How to put your clothes away. This is no joke. On 1 February, the undergrads over at Apartment Therapy ran a piece it's taken me more than two weeks to be able to talk about. 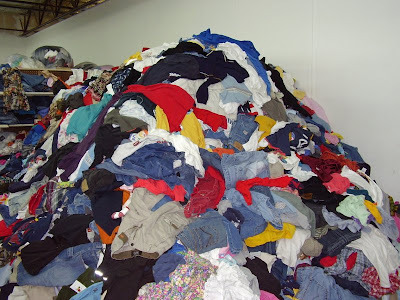 The headline read, How to put your clothes away each day. I'm not kidding. I get it that their readership is skewed pretty young. But really? How to fold your clothes? I'm waiting for a blistering expose on people who don't separate their whites and colors conscientiously. Am I just being cranky? Do people really need this kind of advice? I'm usually so exhausted by bedtime that the the best I can do is throw my clothes at the end of my bed or on a chair. But I've recently employed a new head game with myself that actually seems to be working. It's simple and might sound strange — when I'm tempted to just chuck the clothes somewhere, anywhere, I just start calmly counting seconds in my head. This started as an exercise just to see how long it would actually take to just put the clothes away. I learned that it only takes about sixty seconds to hang up and fold whatever I'm wearing. But this counting practice, which I employ whenever I'm convinced that I'm too tired to put my clothes away, has turned into a successful and oddly meditative pre-bedtime ritual. Seriously. So far, this piece has collected 40 comments. In a quickie run through of them, I saw little more than praise for the author's cleverness. How is adult behavior clever and since when is behaving in an expected, responsible way praiseworthy? Maybe next month we'll be treated to something equally insightful like "How to wash your hands after making stinkies --every time!" Give the young adult credit for trying to be an adult! Haven't you ever avoided a task and had to give yourself a stern talking to to get you to do it? Same thing! LOL --I think I've seen that room before! Oh yes, it's the one my 16 yr old lives in! I've tried begging, cajoling, bribing... Maybe a few words from Apartment Therapy would work but I doubt it. One thing I know for sure is that he WILL get older and, in time, will feel he wants to share his space with somebody who doesn't "decorate" the same way. Libby: I sure have as have most adults who can function. I never expected a medal for doing so though. Rewarding people for performing minimum requirements is absurd. Pam: I think that's the lot of most 16-year-olds. Although I was a freak an never suffered this particular affliction. Not too much anyway. I actually like a lot of Apartment Therapy's posts, but I definitely don't read them all. I like your skewerings better, anyhow. Funny you mention a "How to wash your hands..." piece. A version of that nightmare has already come to pass. About a year ago (maybe longer) Allure magazine featured showering in its 'How To' section. Yes, I'm serious. Readers were provided step by step instructions to assist them in navigating the perilous and complex processes of lathering, conditioning, scrubbing, rinsing and drying. If I recall correctly, there were even tear-out reference cards to accompany the article. Bonus! I gave the copy to the passenger next to me (I always buy a stack of magazines to read on long flights) when I was finished, figuring I'd share the love. I laughed when I heard her say to her friend, "Are they serious?! How to take a &*%# shower?!" hey, that's not *all* 16 year old's rooms! My 15 & 17 year old know better than to leave that kinda mess! Julie: Thanks! My traffic goes through the roof when I write one of these skewerings and all that does is encourage me. Anon: Fantastic story, keep coming back! Nim: I'm with you, I'd have been flayed alive had I tried something like that while I was still under my parent's roof. I think this one gave you fits too, right? I know. I don't get entitlement at all. Hilarious! AT certainly appears to be your Bete Noir! !